Why Are My Pipes Noisy When I Run Hot Water? A common call we get here at Atlantis Plumbing is about the sounds made by hot water pipes in a home. We've heard descriptions like "banging", "creaking", "humming", "knocking" and even "ticking like a clock". Sometimes the solution is simple and we can talk the homeowner through a fix but other times the situation requires a professional call to fix a more serious problem that is causing the noise. So, why are my hot water pipes making so much noise? The most common reason your pipes make noise when you are using hot water is that your CPVC water lines were installed in too small a space. The only solution for this is to go in and either relocate the CPVC pipes or create more space around them. Oftentimes when you run hot water in your home you will hear a variety of different sounds. Everything from creaking, banging, humming and knocking and probably a few other sounds in between. At first, it sounds a bit scary, especially if you hear these sounds during the night. Rest assured that it's a very frequent problem in almost every home. But we do caution that it's not something to ignore. Whatever is causing the noise can eventually hurt your plumbing and also your fixtures. It's important to know that these noises should not be ignored. Whether the problem is due to CPVC pipes installation or water hammer problems - it will only get worse, not better. The longer you wait to correct the problem, the more damage will be caused and the more it will cost you when you have no choice but to fix the issue. There are 2 reasons why your hot water pipes might be making noises. As we stated earlier, the most common reason that you hear noises from your water pipes when you are using hot water is because the hot water is running through CPVC (chlorinated polyvinyl-chloride) pipes which were installed incorrectly. CPVC pipes expand when hot water runs through them. So, when they are installed it's customary to leave enough space around the pipe so that when it does expand, it doesn't knock into a wall or other object (which is what is causing the noise). Solution - The solution for this is to go in and correct the problem by either creating more space around the pipes and/or relocating them. This will usually require a professional plumber to do the job correctly. 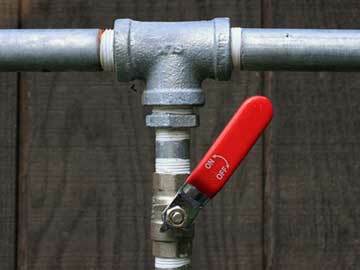 Another reason your hot water pipes may be making noise is due to water hammer problems. The term "water hammer" refers to the noise that is produced when running water hits a closed valve - that is supposed to be an open valve. When the water hits that closure, and essentially has nowhere to go it creates a loud thud. Solution - The best way to fix this problem is to install (and or repair) a water hammer arrestor. This usually looks like a pipe that is located close to a fixture. Your plumber can help you locate it, fix it and/or install one for you. What is the best plumbing pipe for hot water lines? Ideally, stainless steel are the best pipes for your hot water lines. But they are often too expensive for most homeowners. So, we recommend PEX piping. It's a plastic type of pipe that is as flexible as a garden hose. It's resistive to freezing weather which will help to prevent pipe bursts in the winter. It's easy to maintain and very fast to install. Can I use PVC pipes for a hot water line? It's not recommended to use PVC pipes for hot water lines simply because the max operating temperature for PVC is 140 degrees fahrenheit. Most residential hot water comes in at this temperature so anything above that can begin to deteriorate the pipe. If you must use a PVC pipe we recommend CPVC pipes. If you are having problems with noisy water pipes when you're using your hot water, call the Atlanta plumbers - Atlantis Plumbing today at 770-505-8570. We are available 24 hours a day, 7 days a week.